Muse, The Black Keys, Nas, Damian Marley, Dr. Dog, Stone Temple Pilots, and Hole might be some of the biggest names in Austin this year at the South By Southwest Music Festival. But celebrity bands belie the point of the gargantuan, 1,700-band showcase, which includes roughly 44 Bay Area bands, and that's just the ones playing official shows. 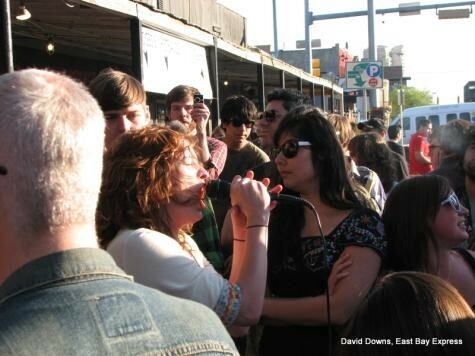 The annual four-day Spring debauch inside the heart of Texas functions as a the nation's music trade show, where thousands of writers and industry types can sample breaking acts that'll be touring all Summer. It's a chance to see if buzz bands can deliver while randomly discovering your new favorite act. Locals metal champs High on Fire are in town, along with Anticon's Themselves, Fat Mike of NOFX as Cokie the Clown, and the lovely LoveLikeFire debuting new material. The Mother Hips, Rogue Wave, and Thee Oh Sees offer the crispest Bay Area psych and indie while The Pack, Mistah F.A.B., Jern Eye and The Jacka show Texas how the Yay Area does it. Standing at the intersection of E 6th St. and Trinity St. — a dozen genres of music pulse through the air, punctuated by puffs of tobacco and the smoky mist of grilled onions and jalapeno bratwurst. Warm, 70-degree dusk ignites the St. Patrick's Day green bedecking the throngs. It could be Bourbon Street, New Orleans, Del Playa Drive, Santa Barbara, or the Castro on Halloween. The sun sets over Beerland, and unknowns A Giant Dog romp through a bluesy rocking set as part of the Martville and Super Secret Records Showcase. Their female lead trails a thirty-foot microphone cord deep into the crowd where she dances on the blocked-off street and bellows the sky black. This is clearly the real March Madness.